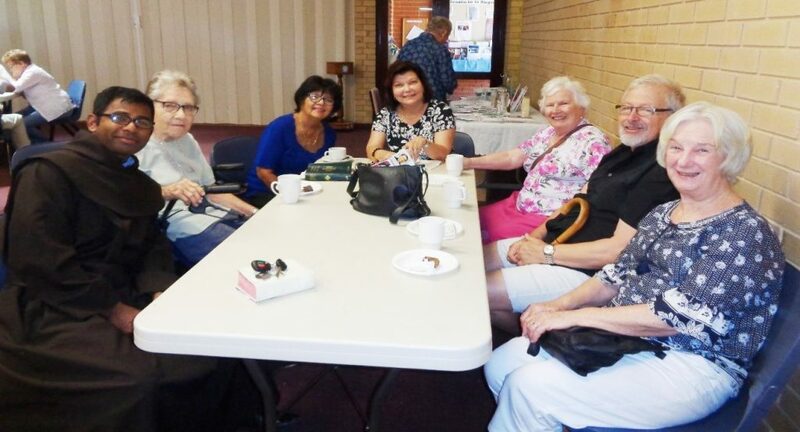 A morning tea was held on Sunday, 13th January to thank Fr. 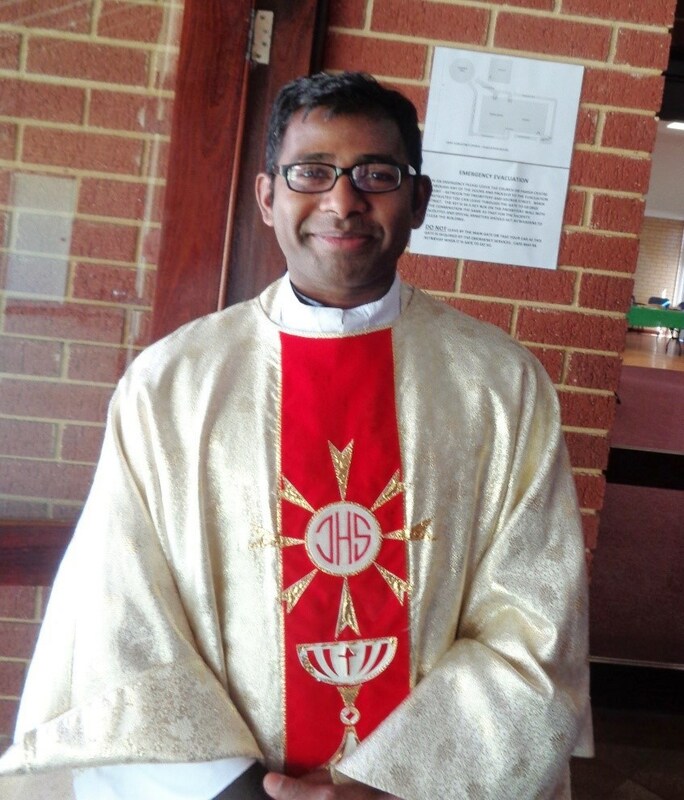 Anson for assisting the parish of St Augustines so much over the last three months. We thank him for his friendly and helpful ways. 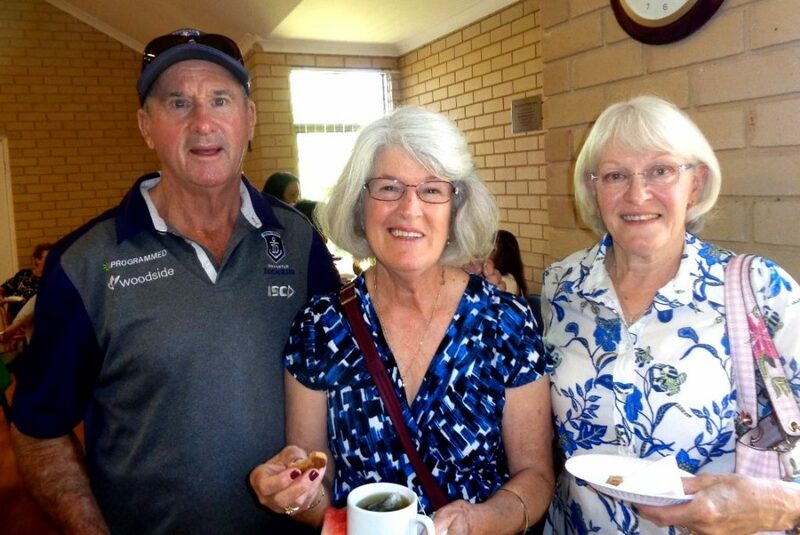 Many thanks to all who helped with morning tea on the day. We wish Fr. Anson all the best for the future. Photo Story by Sheila Cullinane. 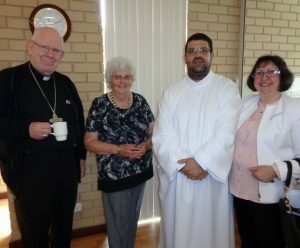 On Sunday, 12th August, 2018, Anne and Ivan Clunes were present at St. Augustines Church for a special blessing by Fr. 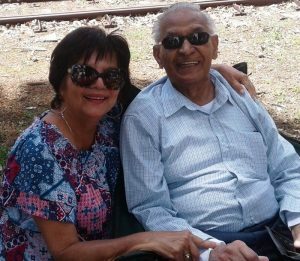 Gayan Thamel, in celebration of their 60th Wedding Anniversary. 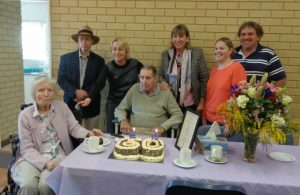 A plaque was also presented in thanks from St. Augustines for all Ivan and Anne’s hard work and generosity over the years. 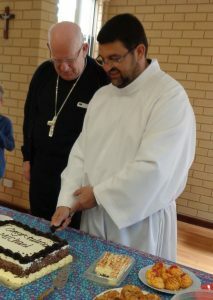 Parishioners were also able to extend their thanks and congratulation by many handshakes and hugs. 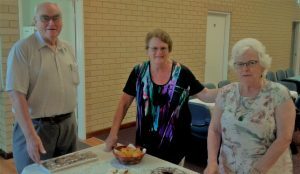 After Mass, a morning tea was held in the Parish Centre at which family and friends were invited to partake of delicious cakes and savouries. 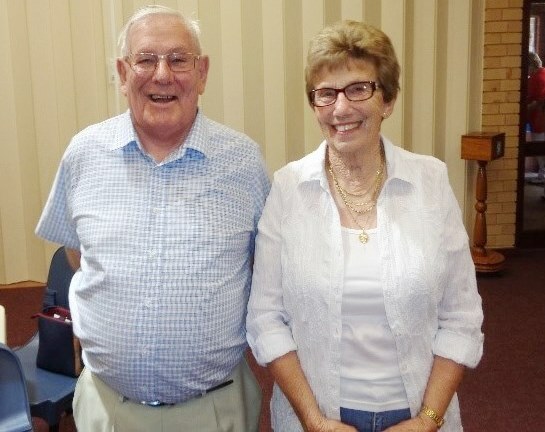 Kevin Stokes extended thanks to Ivan and Anne from the Parishioners of St. Augustines, he said that people knew Ivan as Scratchy and Anne as Min. He first met Ivan in 1956 when he was lucky enough to receive an invitation to the opening of B.P. in Kwinana, and during this meeting a group of Refinery workmen entered and sat in the back row, with Ivan being one of them. Kevin’s brother-in-law was a Fireman at B.P. and introduced Ivan to Kevin who was farming at East Rockingham. From then on, they used to hear this second-hand jeep passing with a friendly toot. It was Ivan. It then progressed to a friendly toot with a blonde, sitting next to him with hair blowing in the wind… the blonde being Anne of course. Ivan was a member of the farmers union so contact was made again. In the following years Ivan was a great worker for the extension of St. Josephs school and organiser for the start of the new Church Programme. He was known for being the boss when it came to dismantling the old Presbytery, the old church and old toilet block. Anne came out from England approximately 1956. 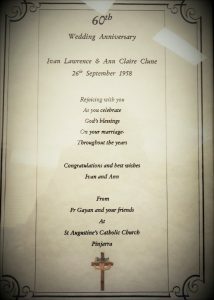 After their marriage they lived on the farm with Anne working hard with bringing in the cows and feeding all the calves besides all the housework. When guests were invited they were treated with the true English spread with table laid to the finest detail. 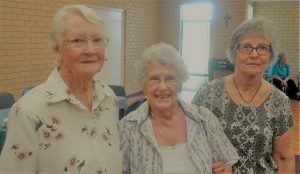 She was one of the early volunteers with Maria Capriotti who cleaned the church which in those days had polished floor boards. 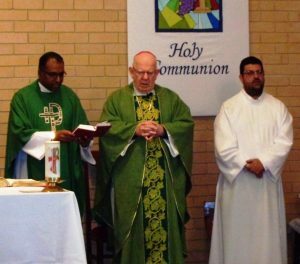 Kevin thanked them once again for their participation in the Parish community. Daughter Meryn thanked Kevin for his kind words and also thanked her Mum and Dad in raising their family through the good and bad times. They were all together for the day which was a blessing. 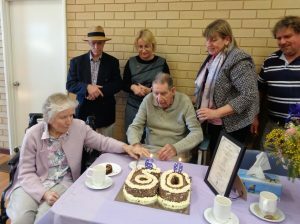 The delicious Anniversary cake, made by Kim’s Bakery, was then cut by Ivan and Anne accompanied by a round of applause. David and Jennifer Miller, employed on the farm and appreciated workers, were also able to attend. 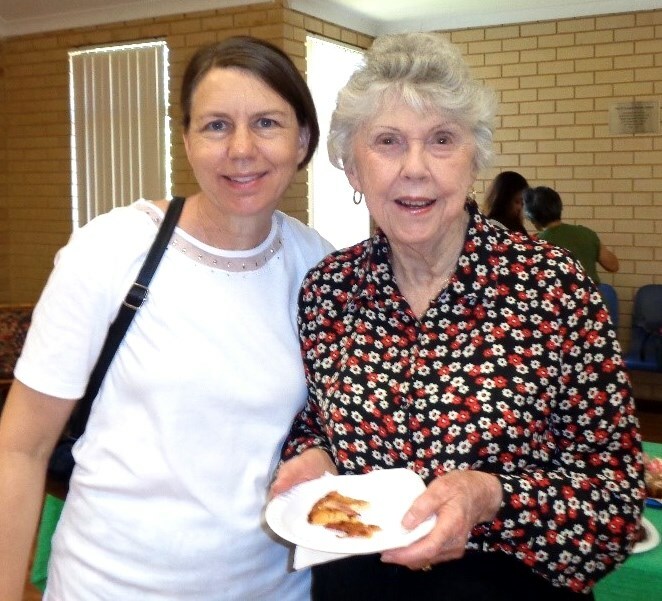 These days Anne is good health and is now a resident of Pam Corker House. Ivan still resides in his home on the farm with help from the community. that they might form a communion of life and love. 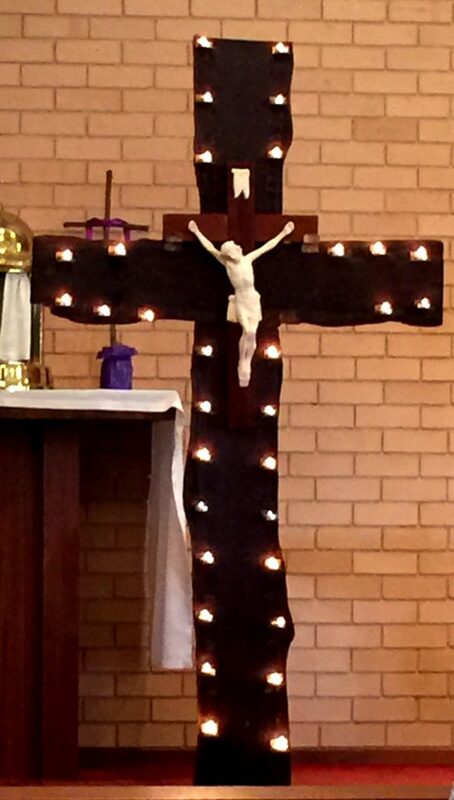 so that it might present an image of Christ’s union with the Church. they may for ever enjoy your blessing. Our latest drive? 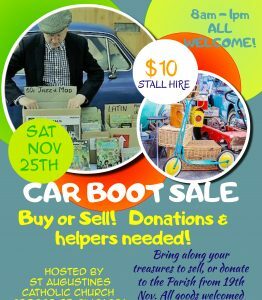 A Garage & Carboot Sale held last Saturday morning, 25th November. 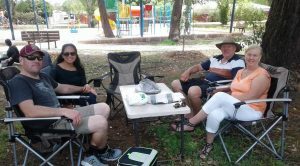 From 8am – 1pm at St Joseph’s school grounds, the sun shone as vendors were busy setting up their stalls and putting their pre-loved goods and treasures up for sale for the punters. 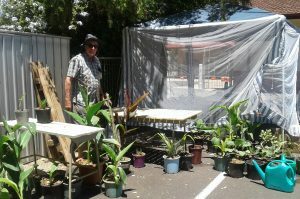 It proved to be quite a successful day in raising important funds for the parish; well done in particular to St Augustine’s clergyman Ray Buchanan, whose plant stall proved very popular ! 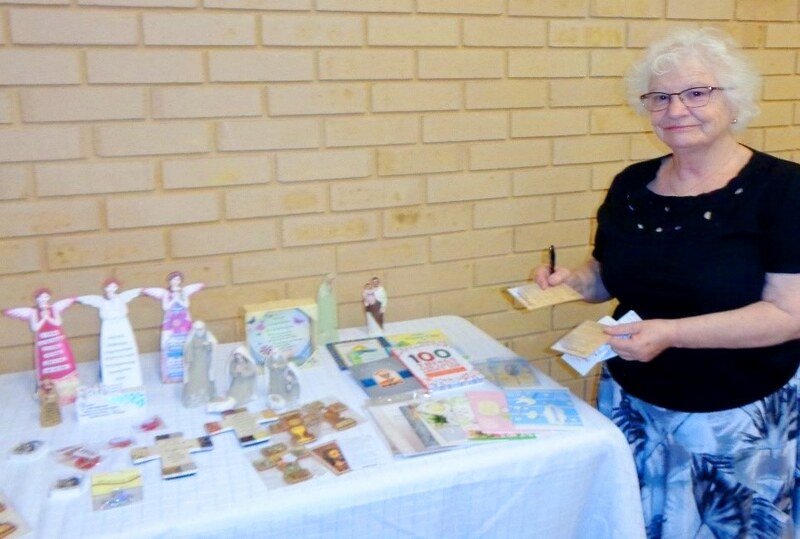 It was also great to have our non-Catholic community join in on the fun and set up their stalls among the flock; we are really lucky to be part of this fantastic little community called Pinjarra, no matter what religion or denomination we may be. 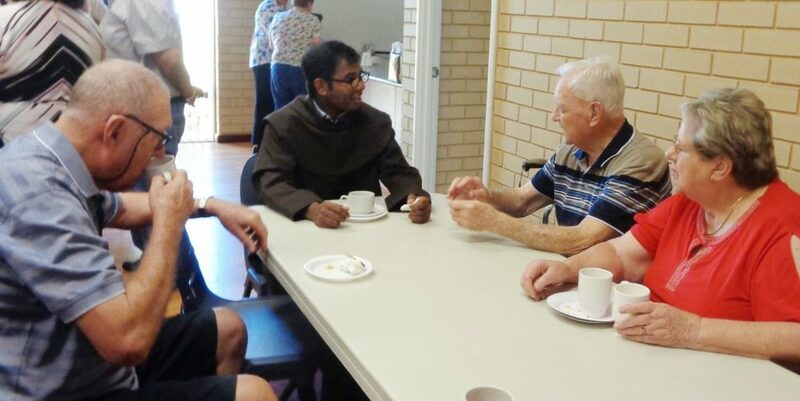 As our blessed Fr.Gayan Thamel articulated ….yes we want to do our best at raising funds, but what it is really all about is bringing the community together. And that it did. A big thanks to St Joseph’s Primary for the loan of the school grounds and to everyone involved who made this year’s Car Boot sale happen. We have a new date locked in for those looking forward to setting up a stall next year. We’ll see you there on Saturday, 2nd June, 2018! More information will be available on our website events calendar closer to the date. 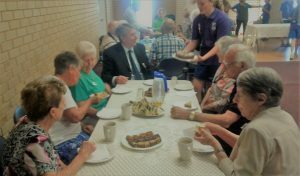 Our local senior citizens were given the royal treatment last week, and rightly so! 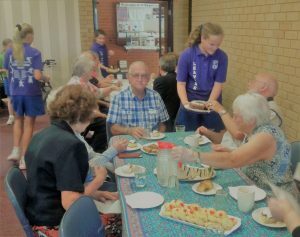 Wednesday, 22nd November saw our year six student’s from St Joseph’s Primary School, host a scrumptious morning tea for our beloved seniors in the Parish Centre. 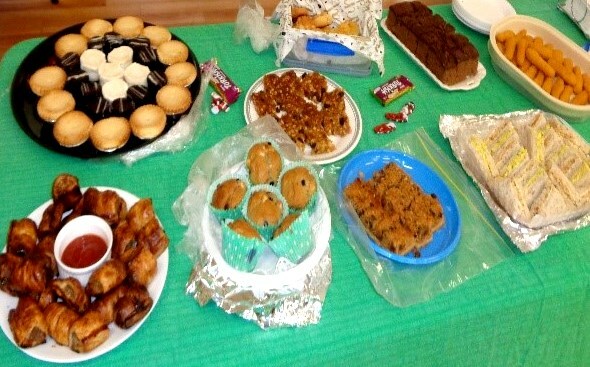 Cakes, sandwiches, scones; you name it, the students served it with smiles and gusto. St Josephs School Choir also popped in for a special performance, much to the delight of an obliging audience. 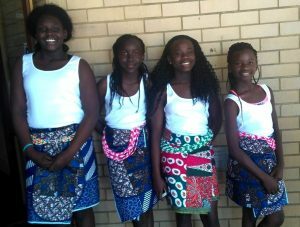 In an age of ipad’s, smartphones and instant gratification, it is an absolute blessing to see the respect and appreciation shown by our children, toward the older generations. Simple events like this one, reminds and encourages our kid’s to keep connecting with their community and the amazing people who live in it. St Augustine’s wishes all the final year students a safe and fun break over summer, and a smooth transition in 2018. 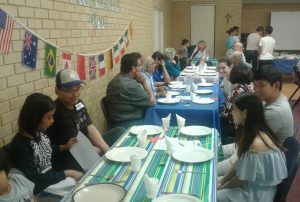 Saturday, November 18th, saw St Augustine’s O’Connor Centre host a ‘Multicultural Dinner’; a celebration of the many different cultures our parish boasts. 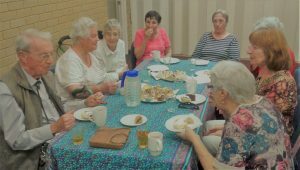 There was a smorgasbord of dishes on offer on the night; from mouthwatering Italian, to the spicy curries of India and Philippines, to an eclectic selection of Canadian, French, Ugandan and British recipes. Ofcourse, the dinner wouldn’t be complete without a selection of homemade desserts and traditional live music to wrap up such a unique community evening. A big thank you to everyone who made the night possible by cooking up a storm; and to all our tireless helper’s in the O’Connor Centre’s kitchen. Congratulations to the lucky raffle prize winners on the night. 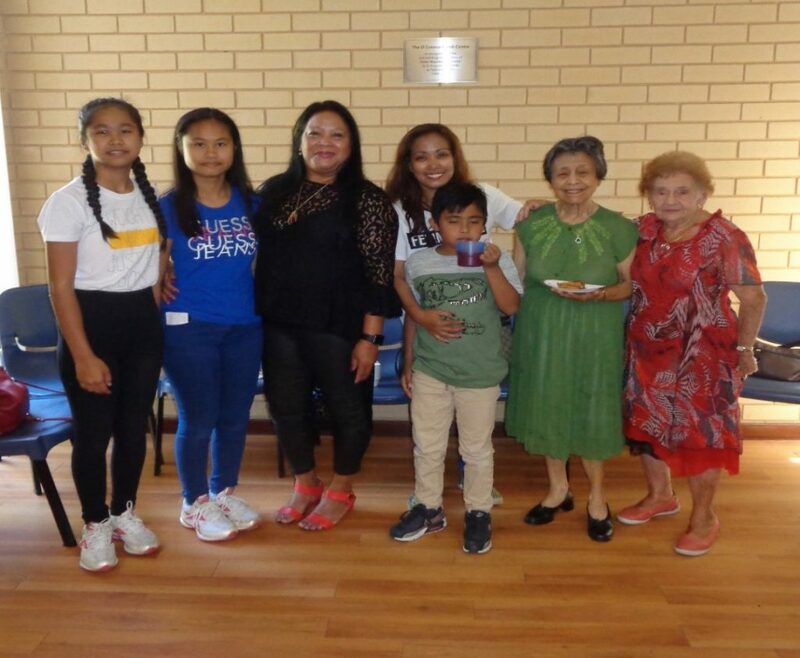 It was another successful fundraiser for our parish this year and an enjoyable way to celebrate the many diverse families who call Australia home. 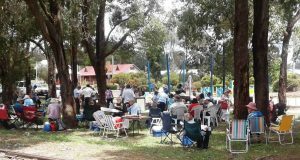 Sunday, October 22nd, saw our three churches; St Patricks, St Josephs and St Augustines, get together for a combined Parish picnic lunch among the trees in picturesque Dwellingup. It was a great turn out on the day. 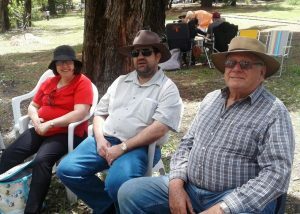 With BYO lunch and soft drinks supplied, St Augustine’s Joe and Angus fired up the barbecues and cooked up a storm. 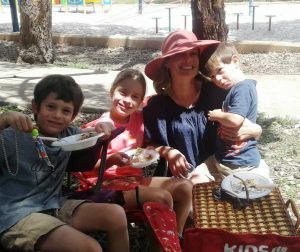 Dwellingup may have one of the highest rainfall counts in the south west, but on Sunday the Heavens were smiling down on us with perfect picnic weather. Thank you to all who could make it, lets hope next year’s weather is just as perfect. Perhaps another prayer to Archangel Uriel will do the trick! 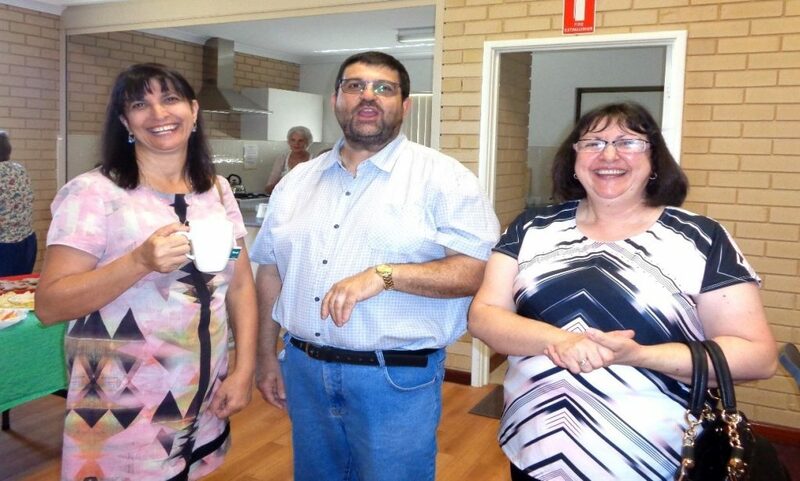 Bishop Gerard, Parishioner Coral Agar and Michael & Lisa Ferraro at morning tea. Photo: S.Cullinane. 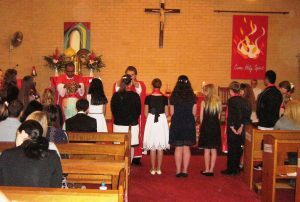 Congratulations to our St Joseph’s Primary School candidates who celebrated their Confirmation during Sunday Mass at St Augustine’s this month! 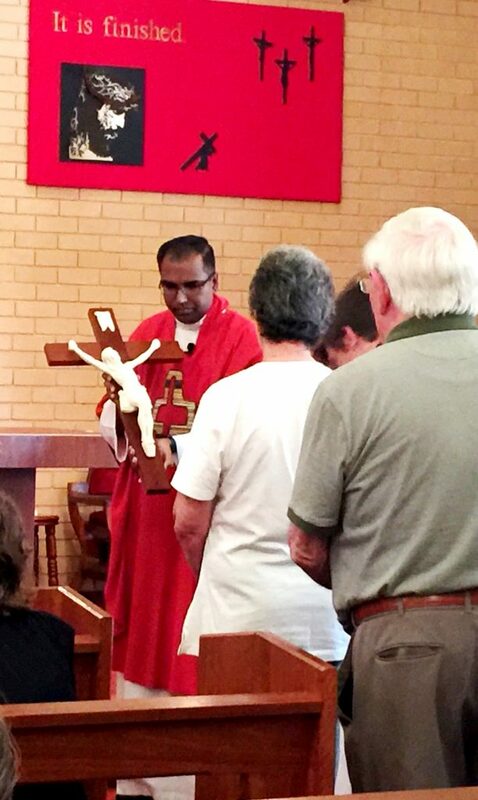 Standing alongside our blessed Parish Priest Fr Gayan, Fr. 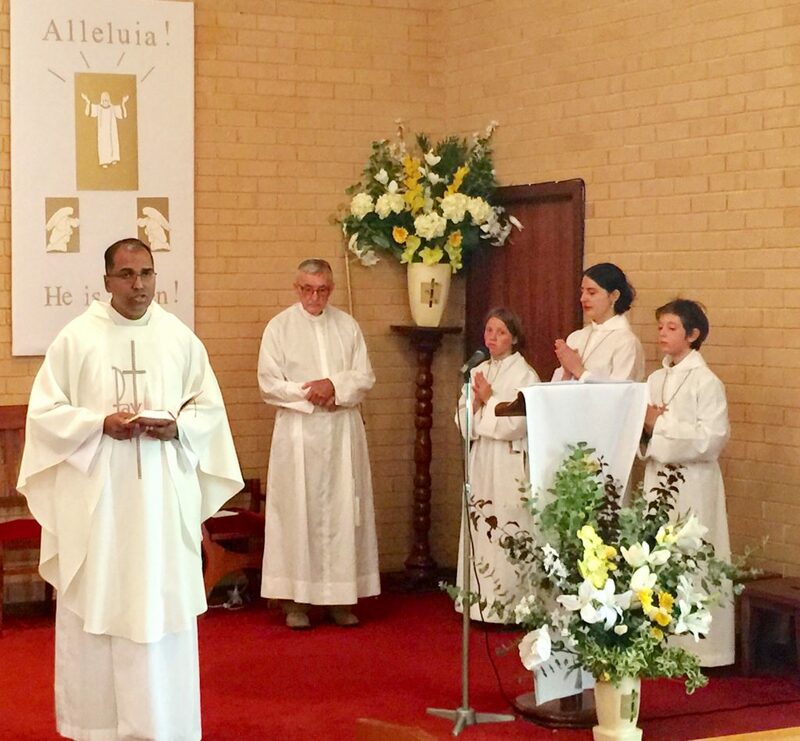 Tony Chiera (Vicar General of Bunbury) lead an impassioned and engaging ceremony as he commended each candidate upon “receiving the Holy Spirit into their hearts”. As always, his homily did not disappoint, sending a fervent message of encouragement and support to the “brave and fearless youngsters” standing before him. And brave and fearless they are, for we all can attest to the dangers and vulnerabilities our youth face growing up in modern society. Fr.Tony addressed the ice epidemic currently sweeping our southwest, quoting an estimate of over one million dollars a year found to be spent by our youth on methamphetamine alone. He asked the congregation in earnest, where is the Holy Spirit in these young people? He touched on the recent Islamic terrorist attack at a Manchester concert in the UK, caused by young suicide bomber, Salman Abedi. Among the twenty two murdered in the senseless bombing, were an innocent young teenage couple, full of love in their hearts and the world at their feet. Fr. 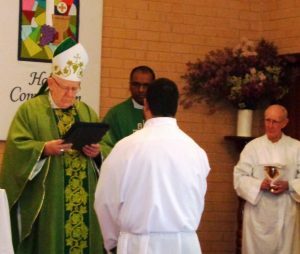 Tony posed the question with warmth, Where was the holy spirit in Abedi when he commit such an abhorrent act of violence? Why does it seem the Holy Spirit is in some of us and not others? It was a poignant moment for reflection. How can we as a community best inspire in our children a desire to receive the Holy Spirit into their hearts? Thanking the families, the candidates and the teachers who lead them, the congregation were asked to join in silent prayer whilst the children received their Confirmation blessing. Again, we thank VG Fr. Tony Chiera for his visit and his role in delivering such a moving and inspiring service for our candidates. Liam Curry [1998 – 2017] & Chloe Rutherford [2000 – 2017]. Two of the twenty two deceased victims of the Manchester bombings, 22nd May, 2017. 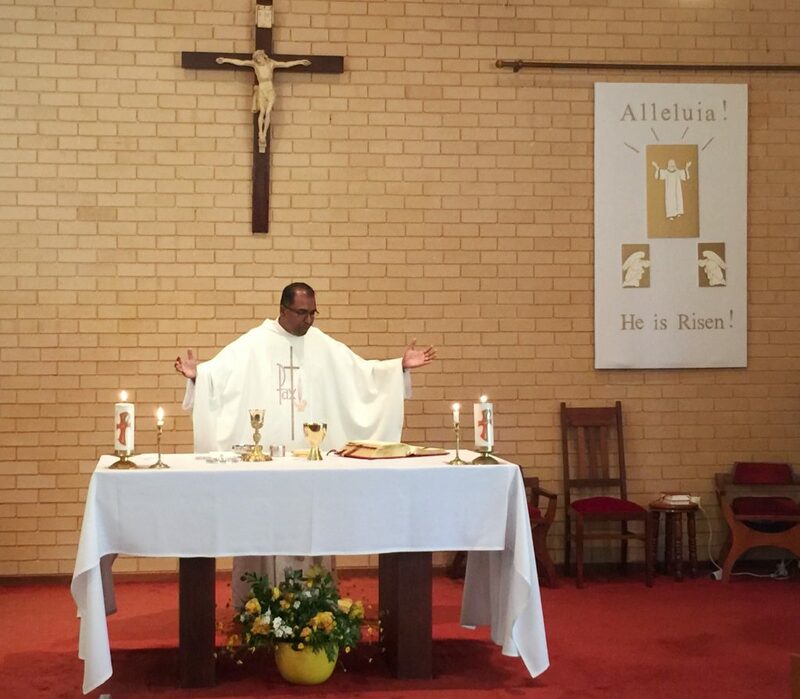 The following photos were taken during Holy Week, 2017, at St Augustine’s Parish, Pinjarra. It is a time honoured tradition to remember those who fought so bravely in April, 1915 on the shores of Anzac Cove, Gallipoli. 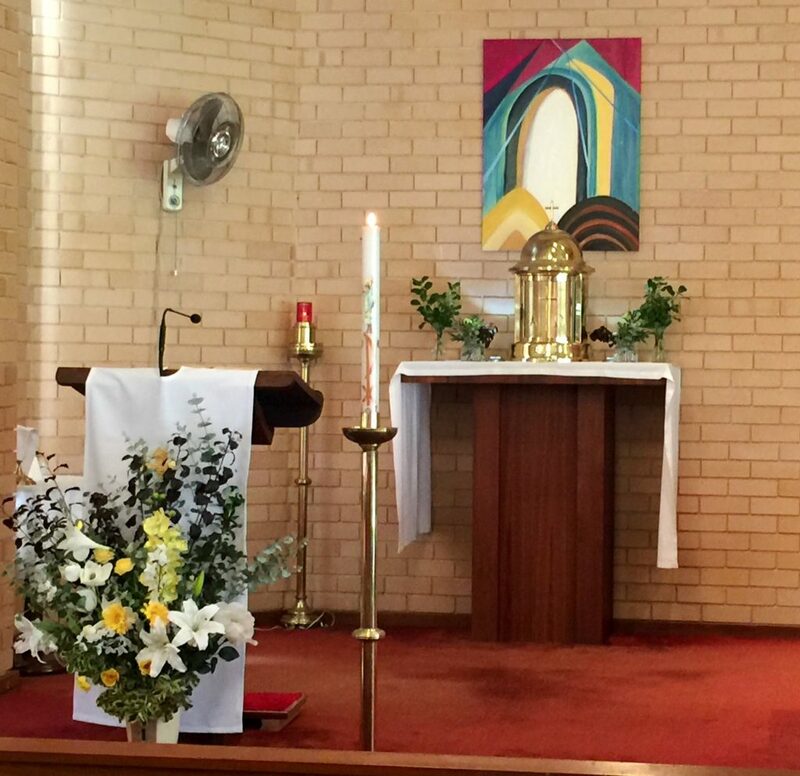 On 23rd April, 2017, St Augustine’s Church upheld this reverent tradition, offering a very meaningful Anzac Service for parishioners during Mass. 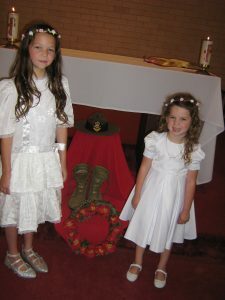 The service was opened by Irene Stokes, whom read for us a short but notable history on the Anzacs, followed by the laying of the wreathe (also made by Irene) by two of our adorable parishioners and students at St Joseph’s Primary School. A particularly touching moment was the Ode, read by returned serviceman and ex-RAAF Sergeant Dennis Freeman. 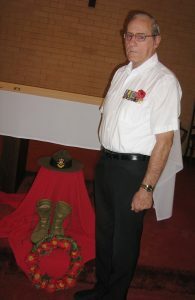 Dennis, a regular parishioner at St Augustines, joined the service at Wagga Wagga, NSW in April 1962, serving in Malaya and Vietnam during the years 1965 to 1967. 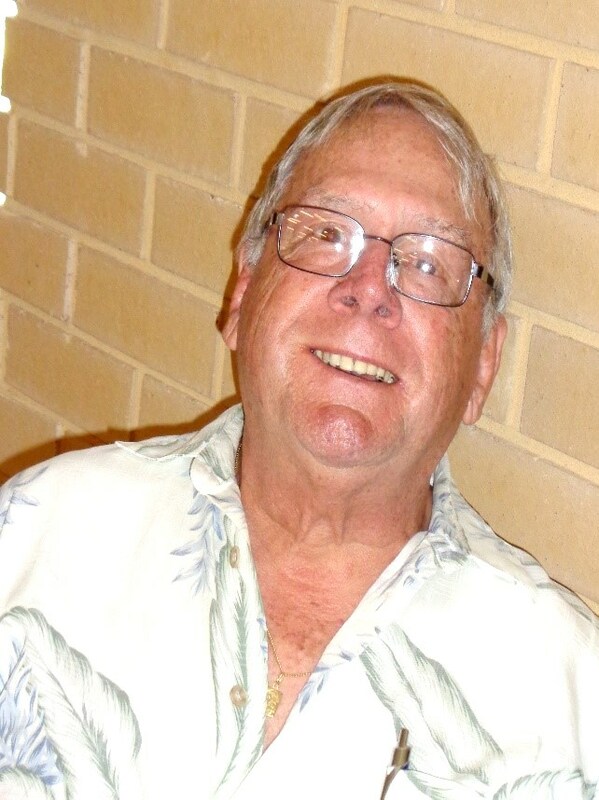 Dennis was honourably discharged at 35 Squadron, Townsville, QLD, after years of service. We thank him greatly for his courageous efforts and personal sacrifice in serving many a nation during the Vietnam War. The haunting Reveille, ‘The Last Post’ was played on the sound system by Kerry Martin, followed by a minute silence. 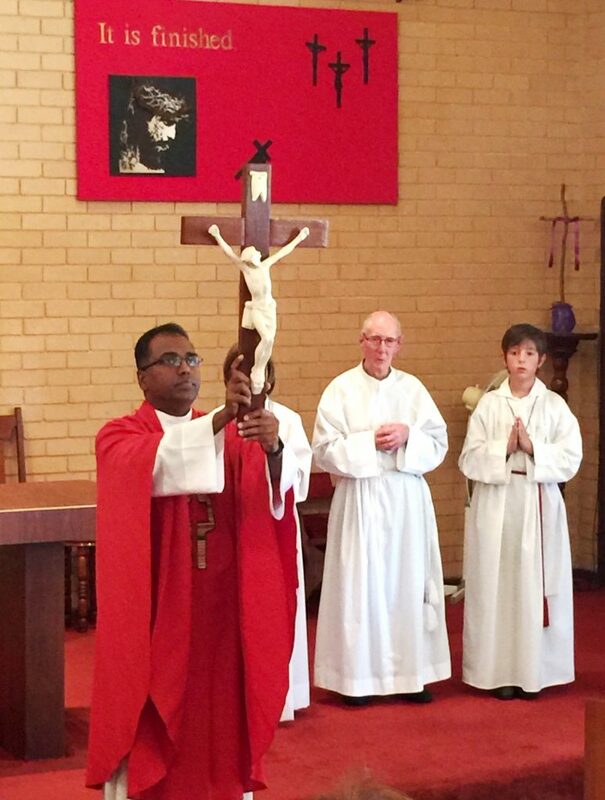 The Anzac Service was concluded with a Prayer of Remembrance, read by Fr Gayan. I speak for many of us when offering heartfelt gratitude to those before us whom laid down their lives in abandon to fight for the ‘lucky’ country we all are able to enjoy today. Australia is only ‘lucky’ because of the servicemen and women who fought to make it so. So many of us have family who served in war and thus no doubt have been told many a fearless story from the battlefield, passed down from generation to generation. Like Dennis, many also know these stories firsthand. War is engraved on our nation and on those who fought in them. We offer our sincere condolences to those whom lost their lives or the lives of loved ones during these battles that were hard fought and won. Our sincere gratitude also to the servicemen and women whom continue to serve our country so bravely.